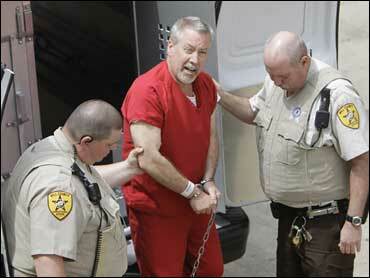 Drew Peterson will have to wait more than a week to answer allegations he drowned his third wife in a bath tub. A judge continued the former police sergeant's arraignment to May 18 because neither of Peterson's attorneys were at the Friday hearing. Peterson was charged with murder Thursday in the 2004 death of Kathleen Savio. He's also a suspect in the 2007 disappearance of his fourth wife, Stacy. He's denied wrongdoing. Peterson didn't speak in court except to tell the judge he understood the continuance. But the 55-year-old was cracking jokes when he arrived. Wearing a red jail jumpsuit, Peterson was brought in handcuffed and shackled around the legs. He told reporters he was getting "three squares a day" and joked about his "spiffy outfit" and "bling." The former Bolingbrook, Ill. police sergeant is being held on $20 million bond. He was arrested during an evening traffic stop Thursday near his Bolingbrook home. His fourth wife, Stacy Peterson, is missing, and police say they consider him a suspect in the disappearance, which they've dubbed a possible homicide. But he hasn't been charged and has repeatedly said he thinks Stacy Peterson ran off with another man. Savio, 40, was found dead in a dry bathtub in her home in February 2004, her hair soaked in blood from a head wound, just before the couple's divorce settlement was finalized. At first, her death was ruled an accidental drowning. But when Stacy Peterson, who was 23 at the time, vanished in October 2007, Savio's family became suspicious and had Savio's body exhumed. Authorities later declared her death a homicide made to look like a drowning. "We are very confident in our case," Will County State's Attorney James Glasgow said. The indictment alleges that "Peterson on or about Feb. 29, 2004 ... caused Kathleen Savio to inhale fluid," causing her death. Savio's family has long voiced suspicions, saying she feared Peterson and told relatives if she died it would not be an accident. Their fears resurfaced after the October 2007 disappearance of Stacy Peterson. Peterson's arrest comes as welcome news for Savio's family. "We always felt that there was foul play involved and we always suspected Drew Peterson," Savio's sister Sue Doman said. Her nephew, Charlie Doman told CBS News, "Finally, we're being heard, and the investigation is moving forward now." On The Early Show Friday, he said Peterson hasn't shown any remorse or sorrow over Savio, noting, "The day we buried her, he went over to the house with a big truck and pulled everything out of the house. So I don't think he had any remorse at all." "I guess I should have returned those library books," a handcuffed Peterson said as state police led him into headquarters following his arrest, according to The (Joliet) Herald-News. Prosecutors may rely on a new law tailored to this specific case. It allows what is called hearsay testimony if it shows a witness was killed to keep her silent, CBS News correspondent Dean Reynolds reports. That would permit allegedly damning statements from either Savio or Stacy Peterson about Drew Peterson - such as what Savio wrote in a petition for court protection back in 2002. "He wants me dead," she wrote "and if he has to he will burn the house down just to shut me up." "In essence what you're basically allowing the victim of a violent crime to do is to testify from the grave," Will County State's Attorney James Glasgow said. One of Peterson's attorneys, Andrew Abood, said the indictment was not a complete surprise. "There was tremendous pressure for the government to do something in this case," Abood said Thursday evening. But Abood said one of Peterson's sons with Savio has "provided a lock-tight alibi" for his father, who faces up to 60 years in prison if convicted. In an appearance on The Early Show last month, 16-year-old Thomas Peterson appeared alongside Drew and defended him, saying, "I highly do not believe that my dad had murdered my mom. Because, first off, he wasn't there, he was with us during that period of time." On The Early Show on Friday, another Peterson lawyer, Joel Brodsky, said forensic evidence his side will introduce will show that Savio's death was indeed an accident. Brodsky also told co-anchor Maggie Rodriguez Peterson would plead "not guilty to all charges, obviously." Peterson has seemed to relish the spotlight since Stacy Peterson's disappearance, appearing in a People magazine cover story and on multiple national talk shows - most recently to tout his new engagement to a 24-year-old woman. "The husband is always a suspect, whether you declare him so or not," Brodsky said when authorities revealed an autopsy on Savio's exhumed body showed she was murdered. Savio's body was found by a friend of Peterson after the police sergeant called him to say he was worried because he had not talked to or seen Savio for a few days. The couple had recently divorced. The friend, Steve Carcerano, has said he went to the house and went upstairs while Peterson waited downstairs. When he found Savio's body in the bathtub, he called downstairs to Peterson, who has said he then ran upstairs, took Savio's pulse, but found none. Peterson's next wife was Stacy, who was 30 years younger. They had two children, who lived with the couple along with Peterson's two children from his marriage to Savio. On the morning of Oct. 28, 2007, Stacy Peterson talked to a friend. Stacy's sister, Cassandra Cales, tried to call her in the middle of the afternoon, and did not get through. Late that night, Cales went to Peterson's home, but neither Drew nor Stacy was there. A few minutes later, she reached Peterson on his cell phone, with Peterson telling her that Stacy had left him. Cales didn't believe it and reported her sister missing the next day. Pamela Bosco, a friend of Stacy's family who has acted as an unofficial family spokeswoman, said "we're just happy for the Savio family." "We always said that Stacy and Kathleen had one thing in common ... Drew Peterson," Bosco said.